Iris is named for a whale which had beached herself the day she was born. Although her grandparents tried to help the poor creature, it died ‘lost in her new silent world’. ‘She wasn’t born deaf like we were,’ Grandpa continued… His signing hands showed me the whale in an ocean that suddenly went quiet, swimming over there, over there, over there, trying to find the sounds again. A natural with electronics, Iris obsessively collects and repairs vintage radios, using the vibrations she feels to tell when they were working again. School is not the most satisfying or fulfilling place for her- as the only Deaf student in a ‘mainstream’ school, she is constantly frustrated by feeling isolated, misunderstood or simply ignored, leading to trouble. One science lesson, however, has her gripped as she learns about Blue 55, a type of baleen whale with a unique song pattern, unable to communicate with other whales. Determined to help him, Iris sets about using her skills to create a song at the frequency of Blue 55’s song so that he won’t be alone. This leads to an amazing adventure, whose outcome benefits more than just Blue 55. 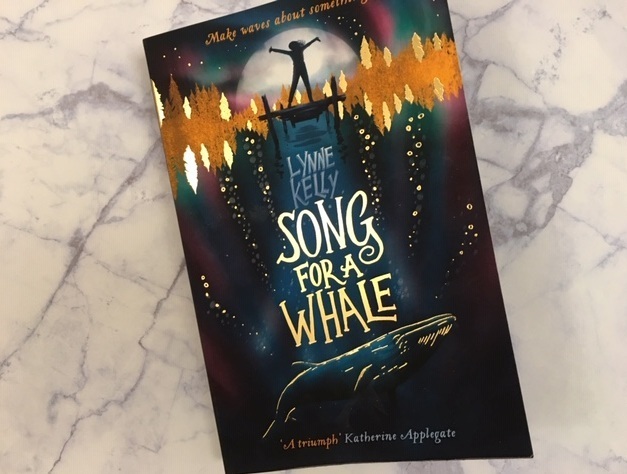 Poignant and powerful, ‘Song for a Whale’ explores and celebrates Deaf culture whilst exposing the daily issues and frustrations many face. This is a story about a talented, determined young lady who happens to be deaf. Iris is a wonderful character, but school is a daily struggle as she feels isolated and misunderstood by those around her. Her frustrations continue at home as her father has a limited command of sign language and her mother is determined to keep her at the hearing school. The parallel between Iris and Blue 55 is skilfully handled, allowing Iris to explore her feelings through her connection to the whale. The scientific aspect of the book is fascinating and the author’s note about whale communication and 52Blue adds to the poignancy of the story. Iris’s passion and empathy for Blue 55 mirror her own feelings and her own struggle to be heard. Having gone to such great lengths to help the whale, Iris comes to the realisation that she can help herself. Alongside Iris’s quest to bring Blue 55 a song he can understand, the story explores the loss of a loved one and the effects of grief. Her grandmother finds a sense of purpose and direction in supporting her granddaughter. This is a beautiful book, beautifully told. The author’s background in signing and working with the deaf adds a knowledgeable perspective to the book and offers the reader a greater awareness of daily challenges faced by the Deaf. A wonderful book for so many reasons!